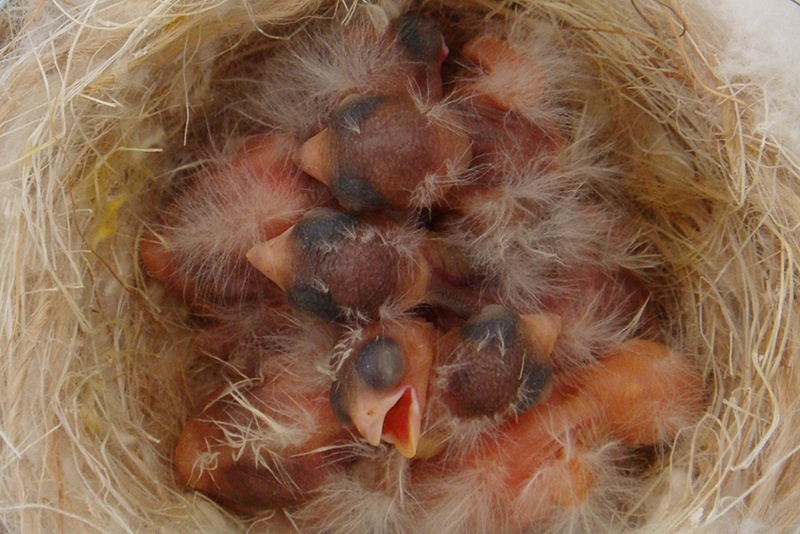 The mortality of the canary chicks in the nest is one of the most serious problems that one can face during the growth of the canary chicks. A large part of these deaths result from bacterial infections. Sometimes germs are found in the gastrointestinal tract and deaths occur somewhere between 5-10 days of life of the chicks. They come mainly from the digestive system of someone of the parents who feeds the young canaries and thus their transfer is easy. The first sign that something is not right in the nest is a broader “yellowing” of the material, but also a similar stain on the belly of the female. The female would normally keep clean the inside of the nest in the early days, sometimes removing and other times eating the droppings of the small tenants, until they themselves begin to retract on the rim of the nest and “squirt” away the contents of their intestines. However, when the bowel movements of the chicks are liquid (diarrhoea) during the first days, there cannot be a proper cleaning by the female. Keeping them inside the nest aggravates the situation, raising the humidity and the risk of additional potential sources of infection. The diarrhoea continues, dehydration is generated and weakness occurs. Thus it does not take long for the end to come. Before long the young ones cease to insistently ask and later on stop completely, for food from their parents and unavoidably the female begins to be indifferent by not seeing the demandingly stretched necks of its chicks. In this phase there is often a misunderstanding of the behaviour of female and we think she is not feeding properly (gave up on them). How wrong are we! Why only the canary chicks die? But why canary chicks die from a disease carried over by their parents without their parents becoming ill? The most likely of course is that the parents, even though they are healthy they are also germ carriers. That is why in large farms, the operators resort to preventive medications one or even two months before mating. For us, a daily, careful observation of our birds but also the absolute cleanliness is the best. If we have birds that we constantly are seeing them having the same lively and pleasant demeanour, but also if we keep the cleanliness standards high, it is likely that we will have a breeding season without surprises. As to the latter I would say (although it could be a whole topic in itself) that we should not put birds in our space at the last minute. We should buy birds at least two months before so that any attacks from viruses to our new acquisitions have already appeared and treated during the quarantine period and not when the time comes for “marriage”. The fewer mistakes and the better preparation we make when it’s time for breeding, the more birds we will have in our company in the near future. Another great danger for our young birds is the presence of red lice. This is an external parasite with great possibility of rapid spread. During the day it hides in crevices and folds. It usually appears at night on adult birds, but during the period of incubation it “attacks” females also during the day and later on attacks the chicks by drinking their blood. An even greater danger resulting from its presence is the spread of a serious, especially for young birds, disease, Lankesterella – atoxoplasma. It is known today as Toxoplasma. Our chicks that have not yet acquired a strong immune system are very likely to be infected with this disease by the action of the red lice and the losses are great. Known anticoccidials such as baycox, esb3 and finicoc are those that promise some solutions. The best measure here as well is prevention by rigorously cleaning them. Could hard boiled eggs cause my baby chicks to die? They are fife canaries.